Butchers in Ibadan protest demolition of Abbatoir – Royal Times of Nigeria. Butchers of Bodija abattoir, Ibadan, Oyo State have protested over last weekend’s demolition of their abattoir by the state government. Some of the reservations of the butchers includs poor accessibility to the new location for meat buyers and sellers, loss of working capital, tendency for incessant clash between butchers and Hausa Cattle sellers, unemployment explosion, cases of armed robbery on the proposed route. 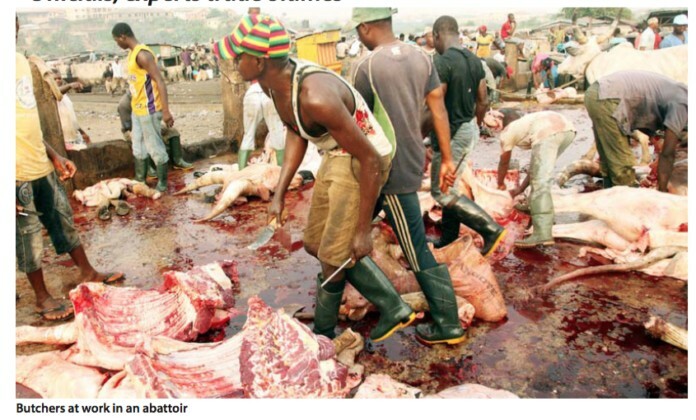 It will be recalled that the state government had given butchers in Ibadan a June 11 deadline to leave for the central abattoir at Amosun village, Akinyele local government area of the state, with some butchers expressing reservations about the directive.